The International Organisation for Standardisation (ISO) and Australian/New Zealand Standards (AS/NZS) help classify specific product attributes and communicate the quality and protection levels of personal protection equipment. The standards are designed to assist managers in the provision and maintenance of workplace safety levels. The elimination of health and safety workplace hazards is mandated by government legislation. Where they cannot be eliminated, employers are responsible for reducing hazards to a minimum as is reasonably practical. As a result, they have implemented a number of identical standards to those used in Europe. For example, standard EN420 (AS/NZS 2161.2:1998) - Occupational Protective Gloves, General Requirements - defines requirements for all protective gloves (except electrical and medical gloves) for glove construction, cleaning, comfort and efficiency, marking and information. While the majority of the Australian/New Zealand occupational glove standards are identical to the European standards, there are instances where the European standard has been revised, but the Australian/New Zealand standard has not been changed. This is why, for example, the protection against cold standard AS/NZS 2161.5:1998 is not the same as the European cold standard EN511:2006. The requirements are similar but the two standards use different testing methodologies. Above is a guide to pictograms used for the EN Standards. The PPE directive 89/686/EEC specifies two classes of glove meeting two levels of risk: ‘minimal’ and ‘mortal’ or ‘irreversible’ risk. A risk which falls between the two levels may be described as ‘intermediate’. A system of marking has been developed to identify the level of risk to help you select gloves of the appropriate class. For gloves of simple design offering protection from low level risks, e.g. janitorial gloves, manufacturers are permitted to test and certify gloves internally (i.e. there is no requirement for testing and certification by an independent body). Gloves designed to protect against intermediate risk, e.g. general handling gloves requiring good cut, puncture and abrasion performance, must be subjected to independent testing and certification by a notified body. Only these approved bodies may issue a CE mark, without which the gloves may not be sold. Each notified body has its own identification number. The name and address of the notified body that certifies the product has to appear on the instructions for use that will accompany the gloves. Gloves designed to protect against the highest levels of risk e.g. chemicals, must also be tested and certified by a notified body. In addition, the quality assurance system used by the manufacturer to guarantee homogeneity of production or the quality consistency testing of the final product must be independently checked. The body carrying out this evaluation will be identified by a number which must appear alongside the CE mark (in this case, 0493). This standard defines the general requirements for glove design and construction, innocuousness, comfort and efficiency, marking and information applicable to all protective gloves. This standard can also apply to arm guards. A glove is an item of personal protective equipment which protects the hand or any part of the hand from hazards. It may also cover part of the forearm and arm. This standard specifies the capability of gloves to protect the user against chemicals and/or micro-organisms. The ‘chemical resistant’ glove pictogram must be accompanied by a minimum three digit code. This code refers to the code letters of the chemicals (from a list of 12 standard defined chemicals), for which a breakthrough time of at least 30 minutes has been obtained. 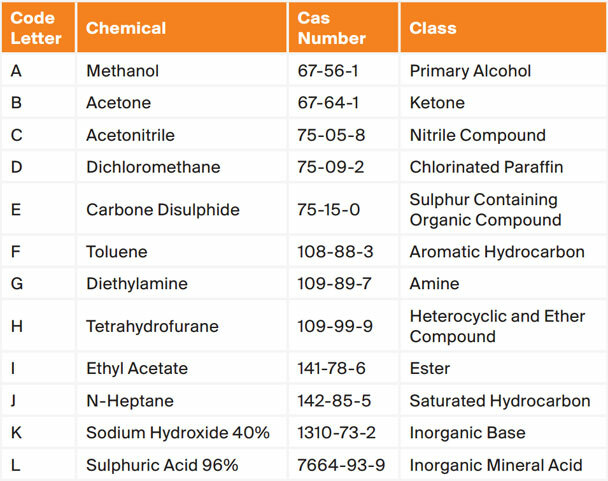 Each chemical tested is classified in terms of breakthrough time (performance level 0 to 6). The ‘low chemical resistant’ or ‘waterproof’ glove pictogram is to be used for those gloves that do not achieve a breakthrough time of at least 30 minutes against at least three chemicals from the defined list, but which comply with the penetration test. The ‘micro-organism’ pictogram is to be used when the glove conforms to at least a performance level 2 for the penetration test. Based on the number of cycles required to cut through the sample at a constant speed. Based on the amount of force required to pierce the sample with a standard-sized point. In all cases above, 0 indicates the lowest level of performance. These performance levels must be prominently displayed alongside the pictogram on the gloves and on the packaging which immediately contains the gloves. This standard specifies thermal performance for protective gloves against heat and/or fire. The nature and degree of protection is shown by a pictogram followed by a series of six performance levels, relating to specific protective qualities. Gloves must achieve at least performance level 1 for abrasion and tear. This standard applies to any gloves to protect the hands against convective and contact cold down to -50 °C. Protection against cold is expressed by a pictogram followed by a series of three performance levels, relating to specific protective qualities. To protect from radioactive contamination, the glove has to be liquid proof and needs to pass the penetration test defined in EN374. For gloves used in containment enclosures, the glove shall pass in addition a specific air pressure leak test. Materials may be modelled by their behaviour to ozone cracking. This test is optional and can be used as an aid to selecting gloves. To protect from ionising radiation, the glove has to contain a certain amount of lead or equivalent metal, quoted as lead equivalence. This lead equivalence must be marked on each glove.